The retailer's shares are performing well over the last year, but will the good times last? 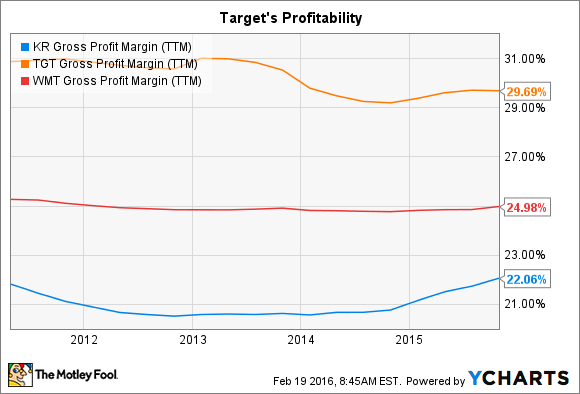 Target's (NYSE:TGT) stock outperformed the market -- and trounced rival Wal-Mart (NYSE:WMT) -- over the past year as sales and profit growth picked up steam after slumping in 2014. The retailer is set to post earnings results for the critical holiday season quarter on Feb. 24, and the latest numbers will go a long way toward showing whether investors' recent optimism has been well placed. With that in mind, here are three positive business trends that would likely power long-term gains for Target shareholders going forward. Customer traffic trends are fundamental to Target's ability to achieve strong comparable-store sales. That's why it was good news for the business when it posted its 12th straight month of traffic gains in November. More customers browsing the aisles powered Target's comps growth of 2%, outpacing Wal-Mart's 1.5% uptick. For the holiday quarter, Target executives projected comps again rising by about 2%. If it hits that target, it will have expanded its recent lead over Wal-Mart, which this week revealed that comps ticked higher by just 0.6% over the holidays. Wal-Mart's customer traffic growth also slowed down from 1.7% in the prior quarter to 0.7% in Q4. Target will be aiming for stronger traffic figures for the holiday period and for all of 2016. In fact, CFO Cathy Smith said in a recent conference call that management was "laser focused on this metric as a key indicator of the health of our business over time." It's unlikely that Target will see the 4% traffic gains that high-performing retailers like Costco and Home Depot have been posting, but any improvement over last quarter's 1.4% uptick would make a difference. One of Target's big competitive advantages is its deep selection of products and brands that other retailers can't match. These include areas like beauty, baby, health and wellness, and home, which executives lump together to call Target's "signature categories." Target exclusive product lines help boost profit margins. Image source: Target. It's important that the retailer succeed with these products for two reasons. First, signature categories differentiate it from competitors and promote customer loyalty. And second, they power profit margins that are unusually high for a national retailer. KR Gross Profit Margin (TTM) data by YCharts. Even though groceries make up a significant part of its business, Target's 30% gross margin trounces even profitable supermarket chains like Kroger, along with retailers with broader shopping selections like Wal-Mart. Those high-margin signature categories have been growing at a faster pace than the rest of the store lately, which points to improving profitability. On the other hand, if Target's selection moves out of step with its core customer, then sales and profit growth could both disappoint. Like most retailers, Target is working hard to adapt as customers move more of their shopping online. The market opportunity is huge, but so are the risks. In the third quarter, Target's online growth was 20%, compared to just 1.4% at its bricks-and-mortar locations. Yet e-commerce makes up a tiny slice of the business -- just 2.7% (compared to 5% for Home Depot) -- and its growth pace actually slowed down in the third quarter. Target needs to do a better job of driving sales through its website and mobile app so that e-commerce develops into a significant revenue channel. While it's debatable whether the retailer will see healthy returns from a big digital presence, the costs of competing online are sure to hurt its short-term earnings results. Target is retrofitting stores by the hundreds to double as distribution centers in a bid to get shipping times down. These initiatives will add significant expenses to its cost structure, but the retailer doesn't really have a choice. It is "critically important" that Target become a leader in the online sales channel, according to CEO Brian Cornell.